The kids just started back to school yesterday and I can’t believe it is fall already! Down here in south east Virginia we like to coast into fall slowly and savor every bit of warm weather possible. Fall is a gorgeous time of the year along our coast and I am so happy to be partnering with HomeGoods and 7 other amazing bloggers this autumn to share my coastal Fall Home Tour! And best of all we each get to give away a $100 HomeGoods gift card to a lucky reader! If you are arriving from Dear Lillie then welcome! I’m so happy to have you! Feel free to start the HomeGoods Fall Home Tour from the beginning with our lovely hostess at Four Generations One Roof. Last fall our home was in complete shambles dealing with our kitchen and family room flood and renovations afterwards. Now it is finished and to be honest, I’m rather giddy with excitement to be able to sit in a clean, sawdust free home and decorating it is simply icing on the cake! 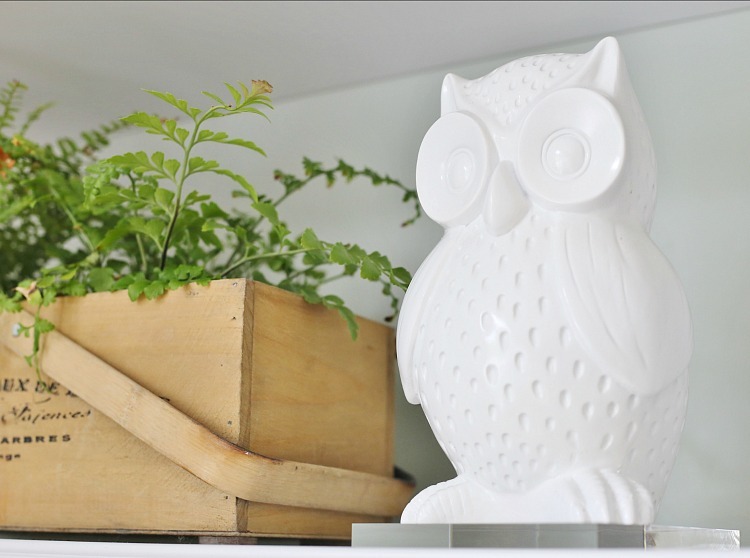 Our home is filled with fab finds from HomeGoods. A new store is opening this October and it is only 10 minutes from my house! Yay! (My husband says, “Oh no!”). The family room is our central gathering place and after a year of chaos I knew our decor needed to exude calm and peacefulness. A soft color palette of blue, gray, greens paired with the warmth of weathered wood, natural elements and gilded metallics help achieve a soothing look that eases into fall quietly. We are thankful for this new family room and kitchen. I can’t even say how thankful I am. This sweet gilded leaf pillow reminds me of it each day too. That is not always easy to do. We are so near sighted and can’t always see the larger picture. I struggled giving thanks when the flood took a lot of my comfort and security away. Compared to what many of my friends have experienced in Louisiana this past month makes me feel horribly foolish and selfish. The larger picture is complete and I’m bursting with gratitude now. Through this journey we were able to stretch ourselves and discover more of our DIY abilities. I can’t tell you how proud I am of the wood beam mantel and fireplace with marble surround that hubs and I built! 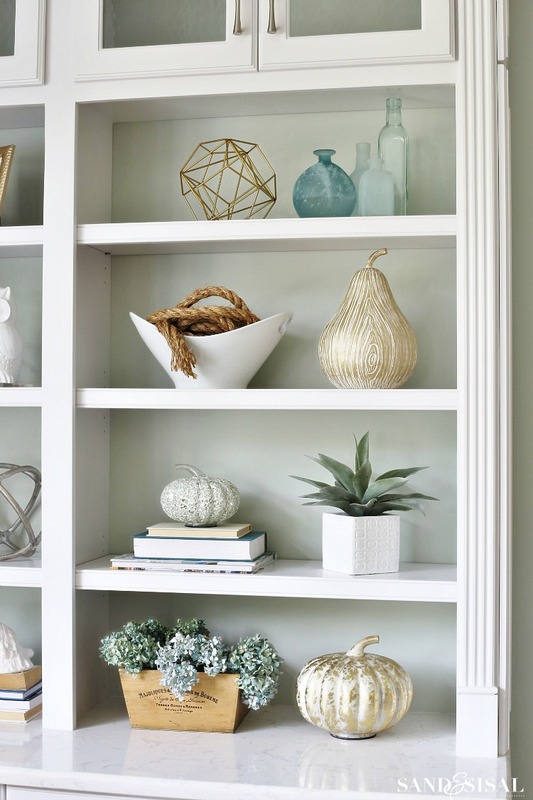 The built-in bookcases are filled with coastal treasures and fun fall finds. I like adding a bit of glitz and sparkle to every room, like these mirrored and gilded pumpkins. They capture the sunlight and look phenomenal with the twinkle of candlelight. I giggled when I saw this faux bois pear. It reminds me of the DIY Faux Bois Pumpkin I painted a few years ago. Real pumpkins are no where to be found yet, so out came the white paint for all the faux pumpkins. 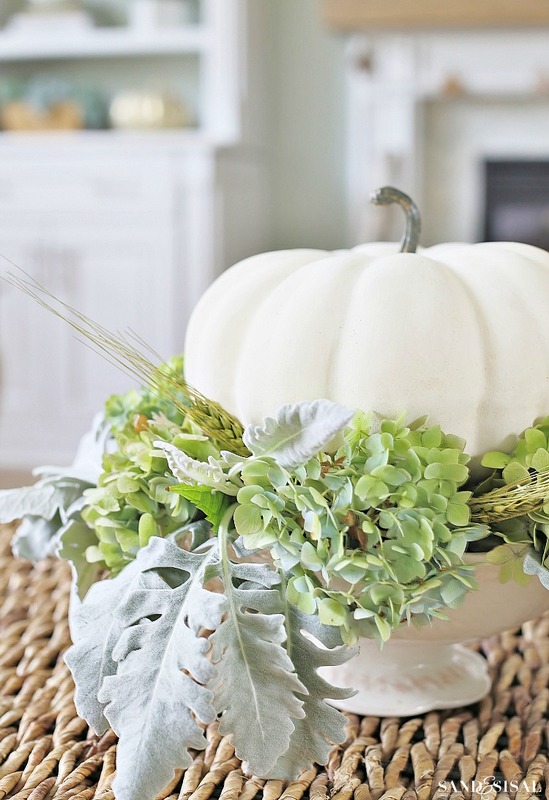 This pretty white pumpkin centerpiece with hydrangeas is so easy to make. I’ll show you how I made it later this week. Come on into the kitchen and grab a bite to eat! I make an amazing crunchy caramel apple pie. See those bins? One is assigned to each kiddo. I empty the bin before the start of the school year. This is where they can dump their bookbag or shoes. By the end of the week, those bins will be overflowing. Right now I will savor in their clean and barren bliss. Today is your lucky day because I’ve got a lovely $100 gift card, courtesy of HomeGoods to give away to one fabulous Sand and Sisal reader! Enter the giveaway in the Rafflecopter entry form below. 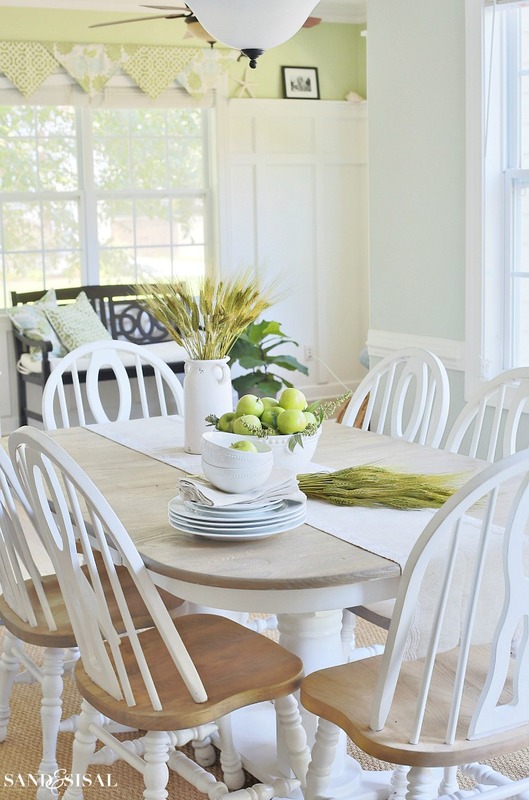 Then make sure to go visit Courtney’s (French Country Cottage) gorgeous fall home tour next! A special thanks to HomeGoods for sponsoring this post and awesome giveaway! All opinions, photos, and expressions are my own. My kids just started school yesterday as well. Now it’s finally starting to hit me that fall is upon us! 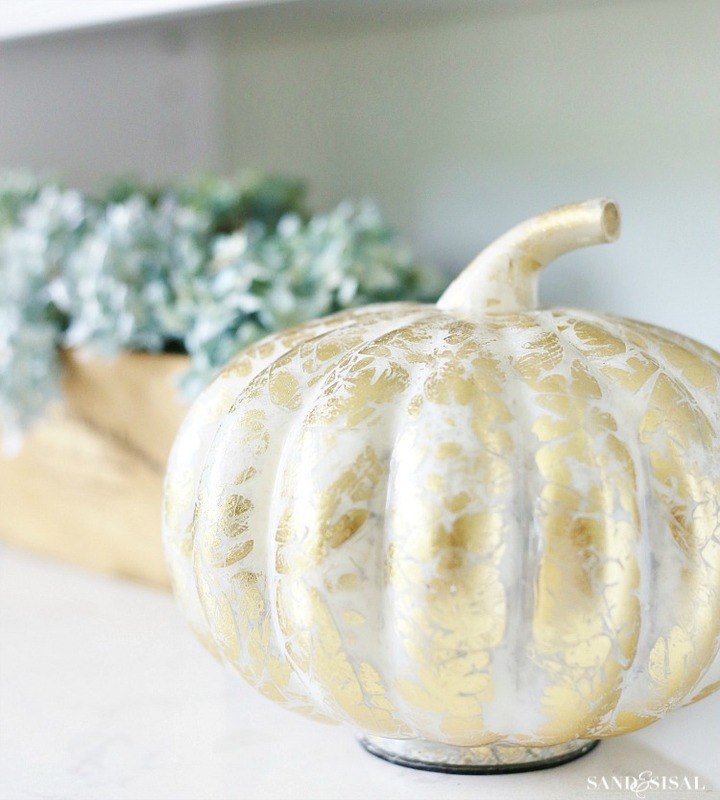 I am loving all your gold accents and have always been a fan of white pumpkins! Homegoods always has such a great selection of seasonal pieces. Thanks for hosting the giveaway and enjoy the rest of your week! your home looks amazing kim….and love those shoes! never feel foolish…we all do it. I definitely love all the pumpkin related items. Your home is so very pretty!! Love the stacked pumpkins light and the wheat bundles. Pumpkins, Pumpkins, Pumpkins!!!! I love your decor. It is so fresh and light. What a nice spin on fall colors! I also love all of the natural light in your home. You just gave me so many great ideas for decorating this year! Beautiful . Coastal beauty and loving the coastal feel !!!! Your home looks like something in a magazine. Love, love, love!! I’m heading out to check out those plaid blankets! They look like they are just the touch I need to add a little “cozy” to my rooms! I love how clean and bright your home is! I am SUPER excited that a HomeGoods is opening 10 minutes from me as well! I will be I trouble. Love your fall design. I am so glad I recently found your blog. My husband and I are moving to the coast of South Carolina from the north in the spring. I am in the process of purchasing my coastal finds and I was not sure how I was going to incorporate the change of seasons into that mix. Your blog has made this a bit easier for me. Thanks so much! Your house is amazing and I only hope I can make mine that way as well. Please keep the inspirations coming! Loved everything in your home. So beautiful. Homegoods is one of my favorite places to shop as well and my closest one is about 45 minutes away but well worth the drive. Just LOVE all of your Fall ideas!!! I love the wheat bundles. Need to head to HomeGoods, haven’t been all summer! Kim, your new room looks amazing! I know you are so happy to have it all done. Between that room and the kitchen, I just adore everything you’ve done. Great job on all of it including the added Fall decor. Happy to be in the tour with you! I love all of the items but my favorite are the sea related objects! I adore your neutral and soft blue shades for fall. The faux bois pear is darling! Good morning Kim~ Thank you for sharing your fall decorating. The outcome of the renovations is gorgeous. Fantastic job! I LOVE your combination of coastal and fall!. All the colors blend so nicely and create a serene environment. Beautiful!!!!! Everything looks wonderful! The colors you’ve chosen are my favorite. I love your blue pillow, plaid blanket and thankful pillow. What a beautiful spot in a beautiful, calm room! Simply lovely, thank you for sharing. Lovely home and idea. I love, love plaid throws, baskets and sea glass. Your place is gorgeous! I love the white cut out pumpkin lantern. That really caught my eye. That pumpkin lantern is also my kids’ favorite item! It is so pretty at night. Thanks for stopping by Donna! Thank you Jess! I’m so honored to be part of the tour! Oh loved the mirrored and gilded pumpkins. Everything was so pretty and I love Home Goods so much always unique items! I can always find something at HG… my wallet knows!!! Thank you so much Stephanie! I love what you’ve done! My home also has a coastal theme, and I’ve been struggling to come up with ideas to transition into fall decor without losing the “coast”. You’ve given me some great ideas – thanks! That is wonderful! Thank you so much! Wow – that is beautiful. I would have never chosen those elements individually in the store but seeing them all together in your home is stunning. I love it.! I love your decor. Great job on the fireplace and mantle. I really like you dining table but how do you protect the top? Is it waxed? Thank you Karen! We refinished that table a few years ago. That table is our main kitchen table and receives a lot of abuse. We gave it a several coats of aerosol satin polyurethane. It has held up well, but probably could use another coat. I have a full tutorial on the blog. Type “Refinish a Table” in the search box and it will come up. Thanks for stopping by! 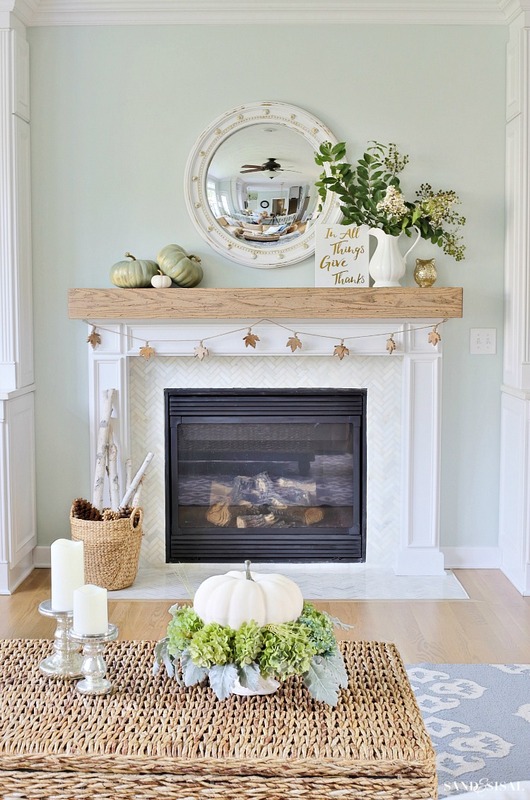 Love your coastal home and how the look is still maintained even with fall décor! I love the bench and the pumpkins gathered on the floor next to it. Might try to copy this look for my foyer. Simply stunning! I love the transitional coastal style! I have too many favorites to list but I have to say what a great idea the bins are for the kids! What a beautiful way to organize school day clutter! Thanks Paula! Those bins have been a life saver for years! Hello fall! Beautiful and serene decor. Love your tour and love your color scheme! You have done the coastal theme beautifully. So glad all of the construction is behind you. Love anything from homegoods! I was looking at wheat bundles at a store last night trying to figure out how to incorporate it in my fall decorating. Your post helped me decide to go buy it tonight after work. Really want to purhase the gilded leaf pillow! I love your light and airy home! I have been wanting to decorate for fall and your ideas gave me new perspective. Thank you! I love your tour! So fresh and coastal and pumpkiny and fally. The pillows, always the pillows. I love the gold foil thankful pillow. That is one of my favorites! It comes in dark teal with gold leaf too. Thanks for stopping by! I like the baskets and different pumpkin decorations. Your house is looking so beautiful and I love all the coastal inspired fall touches. That said I refuse to go anywhere near fall anything for at least a month, but I know where to come back to when I’m looking for inspiration. Love the faux bois pear! I need one! I love the white pumpkin lantern and the mirrored pumpkin. Also love the tall grasses in the bottle next to the upholstered bench. Are those from Home Goods as well? Your style of decorating is what I love. Thanks for such wonderful photos and inspiration! I love the throw blankets!!! I’m blanket obsessed! I really like the owls and cozy pillows. Thanks for the giveaway! The white cut-out pumpkin lantern definitely caught my eye! I love that you kept your Fall decor true to your home, soft and coastal. Absolutely beautiful. Your home is so light and bright! Beautiful!! I love the white cut out pumpkin lantern! Your home is beautiful!!! What is the paint color on your walls, please? Hi Wendie! The family room walls are Sea Salt and the kitchen area is Comfort Gray (the next color down on the swatch). Both by Sherwin Williams. Beautiful home! I too love south eastern Virginia! I also love your array of pumpkins, pillows, and white serving ware. The picture of the crane is lovely as well! I love it all…very pretty! But especially adore the Thankful leaf pillow, the mirrored mosaic pumpkin, and the cut out pumpkin lantern! The Faux Bois Pear, Gold Coral Bowl, Faux White Coral, White Owl Figurine and Gold Whelk Shell were my favorite pieces. I also liked the gold geometric piece on the bookshelf. I need to go to Homegoods soon – love the mirrored pumpkin. I absolutely love your new family room and kitchen. The fall decor you’ve added blends beautifully with your other decor. I’m loving the white pumpkins. Time to pull out my paintbrush! I love those decorative pillows! Love everything in your home! The white pumpkins are so fun! 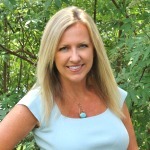 Love your home and love your heart of gratitude Kim. Beauty is in every photo you shared and I especially love the little pumpkins on your stairs…so cute! So funny that none of us could find real pumpkins! Don’t they know we need them for our blogs by August??? lol! So fun doing this tour with you! I love the white and gold pumpkins and the owl! super cute! You and your husband did a beautiful job on your mantle and marble surround. I’m so happy that you will be able to enjoy your home this FalI season. 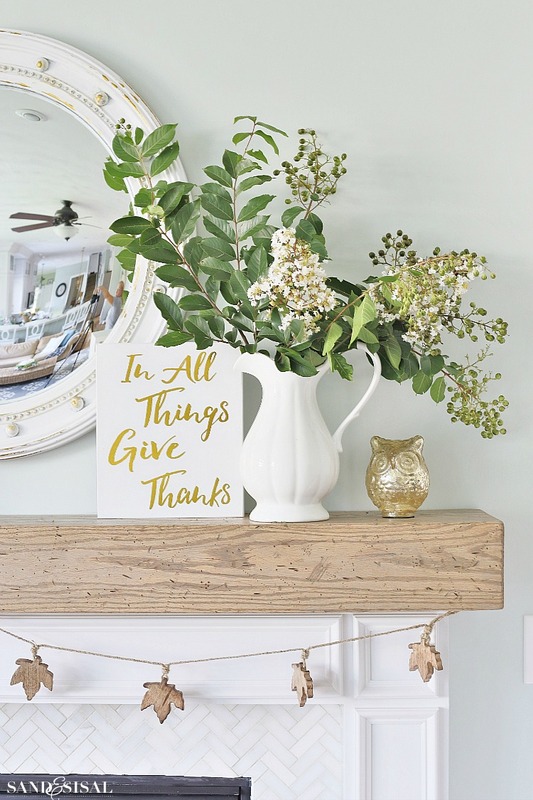 I really love the In All Things Give Thanks art on your mantle. The pillow with the gold leaf design on your couch is so pretty. The faux white corral, white pitcher, and linen napkins all caught my eye. I absolutely love walking through Home Goods and looking at their great selection. I absolutely love the coastal fall decor! Such a gorgeous home! I am curious about the beautiful convex mirror above the mantel – was that something you purchased as is or did you refinish it? Thank you Sherri! That mirror is from Ballard Designs except that I painted it white and distressed the white paint off to reveal the gold underneath. I LOVE your house….I could just move right in!! It’s so comfortable, yet stylish and the colors are so ME. If I had to choose 1 thing I liked the most for fall, it would be the mirrored and gilded pumpkins. I love all the gold but particularly the gold leaf pillow that says thankful! The light, white, bright look really caught my eye. I love it. I like the straw (rope?) pumpkin and the little gold owl. Your living room is absolutely gorgeous. That cute wood leaf garland on the mantle is my favorite. I love the white built-ins. They really lighten the look. Especially with the wall color. Gives me inspiration for my do-over! Love your home! The entryway really caught my eye! 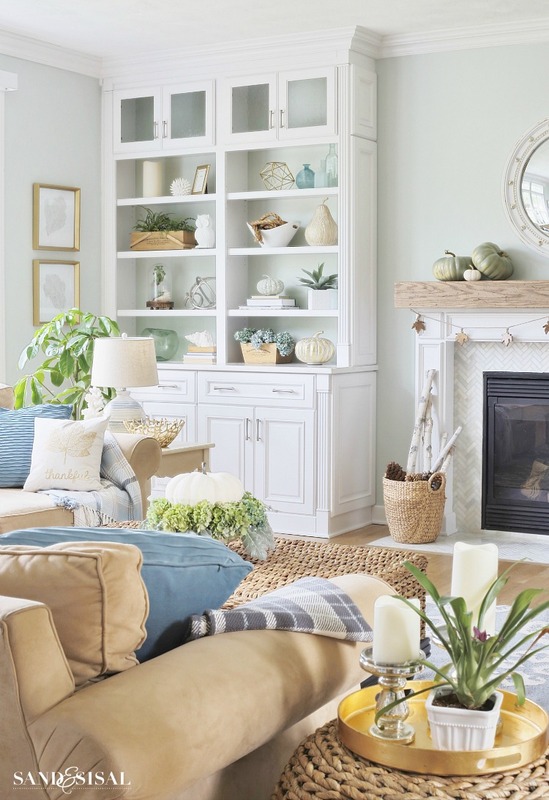 I wondered how to incorporate the beach feeling in my Northern home with your ideas shown, I now can simple tie in the “Sea scape” colors and theme throughout my Northeastern home. I love the feeling of complete harmony here…. by the touches of sea grass texture, gold frames and the way a pop of black wood anchors a room! 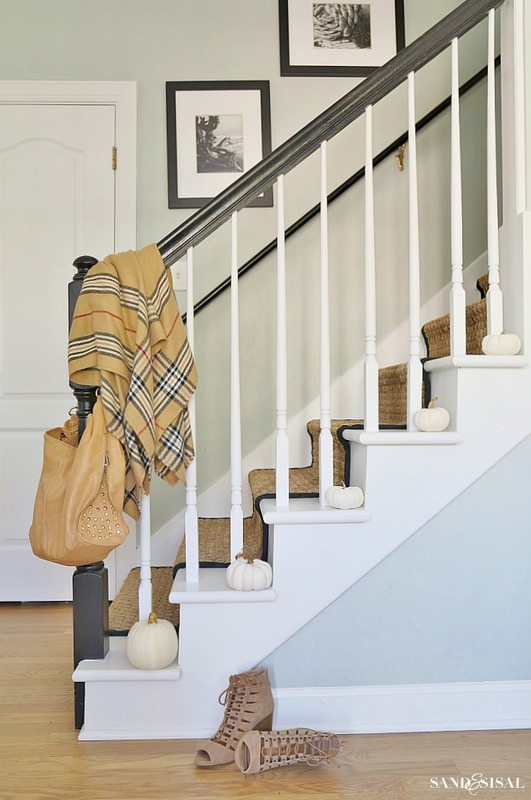 love the placement of the pumpkins along the stairway! Too cute! LOVE the white! So bright and uplifting. The natural wheat bundles caught my eye. I love those! What a lovely fall home tour! It’s hard to believe fall is really right around the corner. I love the neutral touch of your fall home decor. It’s nice to see that fall decor doesn’t need to be saturated with rich colors. I love all the white and bright in your home. 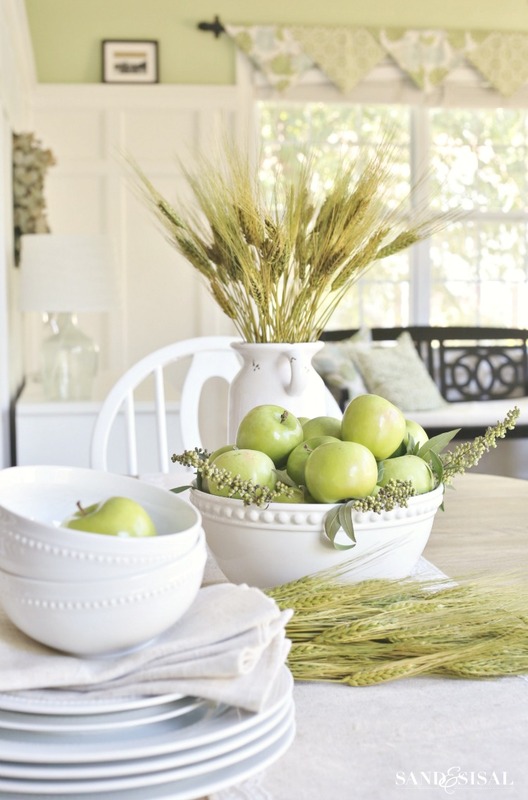 Never thought about making your fall decorations more muted with the whites and light colors. It looks fabulous! Nice Job! I love Homegoods and don’t go there unless I’m looking for something specific because that store is soooo tempting and I always find a treasure! 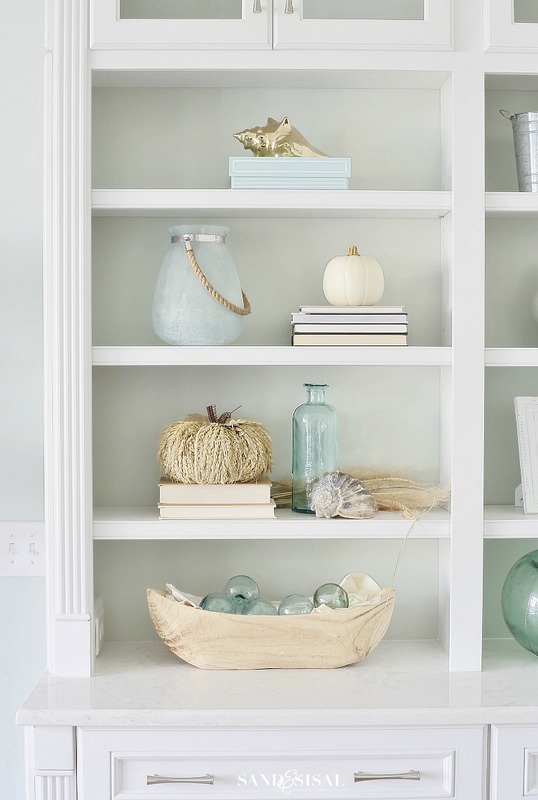 I love the idea of mixing the blue/green items with white pumpkins. It is very unique. Love the wooden leaf garland and the boat of floats. Everything looks so muted and serene with a touch of turquoise to remind me of the coast. Happy, happy fall. Wow! Your family room is gorgeous and it does feel so cozy and welcoming! Love the work you did on the mantle and fireplace. Love it all! Looks so clean, crisp, calm and comfy!! The thankful pillow and the mirrored pumpkin! Gorgeous home! I love the ottoman in your living room and the rug. I want both! What caught my eye? Pretty much everything! I was particularly drawn to the tall glass bottle with rope neck and the sea glass vases. I love how you pulled together a “fall experience”, but with a light coastal vibe. I love the throw pillows and the mirror over the fireplace! I also love everything else! Gorgeous! I love the throw pillows! Your home is absolutely stunning. Love your early fall decor. It’s hard for me to say what I like best, all of it is beautiful… Living in North Alabama, we are still having really warm weather, but ever so slightly, early in the mornings, there seems to be a bit of fall in the air. I think I will start my fall decorating this weekend. Thank you for sharing your wonderful ideas. Love the mosaic pumpkin and wheat bundles! I was actually looking for some wheat today but it all looked so fake- disappointing. I was eagerly awaiting your fall decor post and it all looks beautiful ? Your home is beautiful! I love everything about it!! I absolutely love every piece in these pictures…I sense DIY projects coming on, but also a trip to HG….the room comes together beautifully without being too filled with objects and things! I might have to replicate this in my living room!! Thanks for posting! Love the low country art…the long narrow bird picture! The perfect Fall coastal home … loved your tour!! You hit the jackpot at HG this season, wow! Look forward to seeing more of your gorgeous seasonal home! I love everything I’ve seen,from the furniture to glass floats and everything in between.Home Goods is 1 of my favorite places and I love your decorating style.Thank you! Love that stair case, with the white stairs and runner! The white pumpkins are such a clever way to be season but not tacky! The ‘thankful’ pillow with gold leaf is just lovely! My favorite item is the Thankful leaf pillow. Your home is absolutely beautiful! I was at Homegoods today and saw the most gorgeous tablewares, I love everything fall, it’s full of such warm and inviting colors. Those pumpkins are just adorable. I visited the store in Orlando yesterday and they had a lot of great Fall pillows. The early Fall decor is beautiful. I love the touches of gold and the white pumpkins! Thank you for this beautiful tour! I’m hunting your paint color. So pretty! I love the thankful pillow & your dining table decor! Your home is beautiful, I love the simple elegance of the décor. It is hard to choose a favorite item in your Fall decorations, but I really love the “Thankful” pillow. 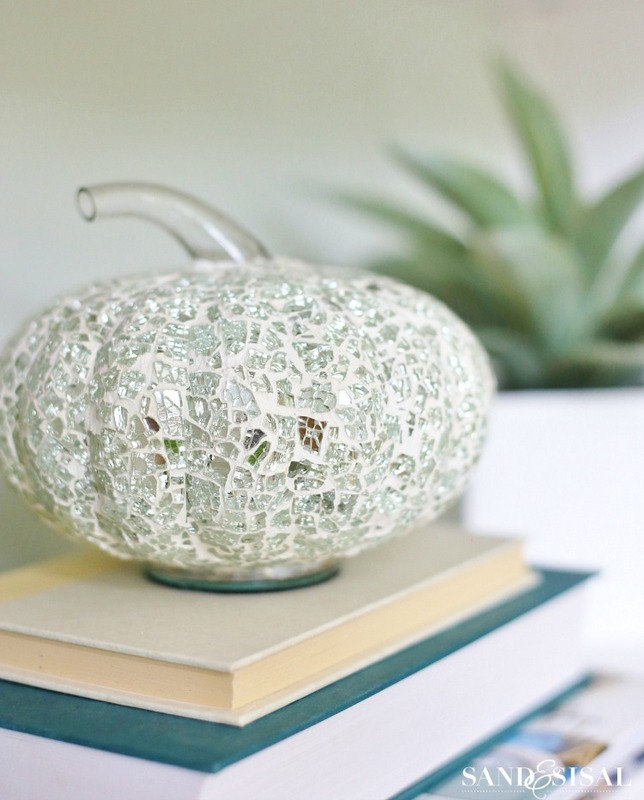 The cut-out pumpkin lantern is both pretty& functional that it is a must have. A few other must haves are the wood leaf garland, the wheat bundles and that adorable wheat straw pumpkin. I’m glad that HomeGoods is nearby! Thank-you for a lovely tour. Those “menswear” pillows. Thanks for the giveaway, a new Homegoods just opened near me, as well! I love all your wonderful white pumpkins! I love all things Fall. 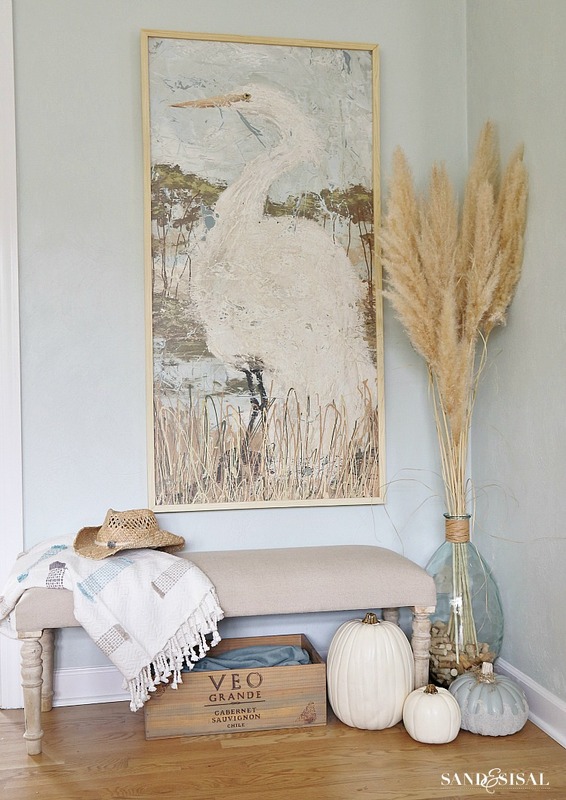 Love how you keep some coastal decor with your fall decor. In the past I have packed and stored our summer coastal when I brought out the pumpkins. Not this year. I love the soothing colors of your home, Kim! My favorite accessory is that adorable sparkly pumpkin! Your rooms are so clean and calm, very inviting. My drive to Homegoods is almost an hour, and each trip is definitely worth the drive. I am never disappointed with the merchandise I find at Homegoods. so very pretty! love fall! Love all the pumpkins especially the mirrored one. I love you pillow and, especially your unique color combo for fall. You celebrzatd the season with such class and refinement. Wow! What a gorgeous color palette! Thanks for letting us peek inside your beautiful home! Your coastal home is amazing, Kim! 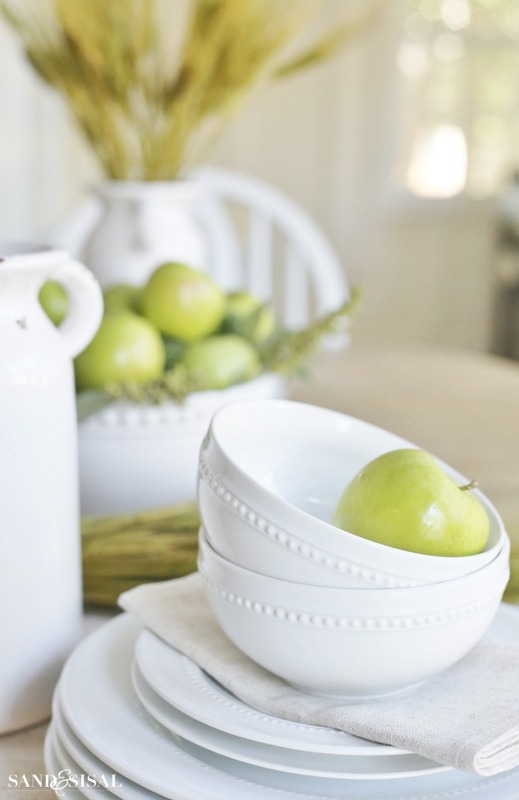 I love the softer side of your fall home tour. You certainly scored some fabulous finds at Home Goods. In fact, I have quite a few things you have listed on your source list. I guess I could say, I have an obsession there! HG is my favorite store for the home. I could shop there seven days a week! ( I just about do) Lol! Sometimes I get a guilt feeling, but my hub says, “keep shopping if it makes you happy”! He spoils me! Kim, I love your ideas about falling into fall softly. I have used your good taste in my home also. I made a fall wreath very similar to yours from last year with butterflies and softer hues of flowers. I used creamy magnolias in mine. I also have a beautiful large turquoise glass bottle with dried grasses. I see you still have yours next to the heron painting. Well…..there have been many compliments on this and even though we have never met, you are given the credit. Thank you for such a beautiful blog and lovely ideas. Thank you Barb! You are too kind! I love the idea of using magnolias in the wreath. I wish I had a magnolia tree. I’m often tempted to knock on some neighbor’s door and ask to harvest a few branches each year! 😉 Have a wonderful week! Such beautiful decor. Love Home Goods. Love your coastal home! You certainly are Home Goods Happy! Where did you find your coffee table? Love your decorating style. And I love Homegoods. Love how light and breezy your rooms look. HomeGoods is my go to store for sprucing up my home when I feel it needs some extra umph too. I love the selection and the prices are unbeatable! I love what you’ve done with your home. I especially love the new fireplace. We have brown brick and I hate it. I actually talked my husband into taking the hearth out when we tiled our floors. The tile is sooo much prettier. Of course you were my inspiration. We hope to build it out similar to your’s. Thank you for the chance to win some spending money for some new eye candy! The best coastal fall home tour ever! So, so pretty! I love your color palette and sleek design. It is all so beautiful and pleasing to the senses. I’ve never visited your blog before but I will definitely be back. Thanks for the inspiration and the reminder that God has a bigger plan for our lives. Your color palette is so, so pretty! I love how you’re able to bring fall into your home using blues and cream. Your fireplace and mantle are stunning by the way! I love the glided leaf pillow! Loved your Fall decor with all the sea elements. I just love your home. Just my shade of blue( I think it is my favorite color) I decorate mostly in blue and white,, so doing fall is difficult at times. Throw pillows for sure! My couch is looking rather plain and could definitely use a fall sprucing up. Love the gold and white. Your home is lovely. Hoping I can find the thankful pillow. Thank you for ideas! I love the way you have mixed the beach-y blues with the fall items. Sea-shell vase and the pillow. I love the sparkly pumpkins and would love to win a HomeGoods gift card! Beautiful home. I love everything about it! Stunning! 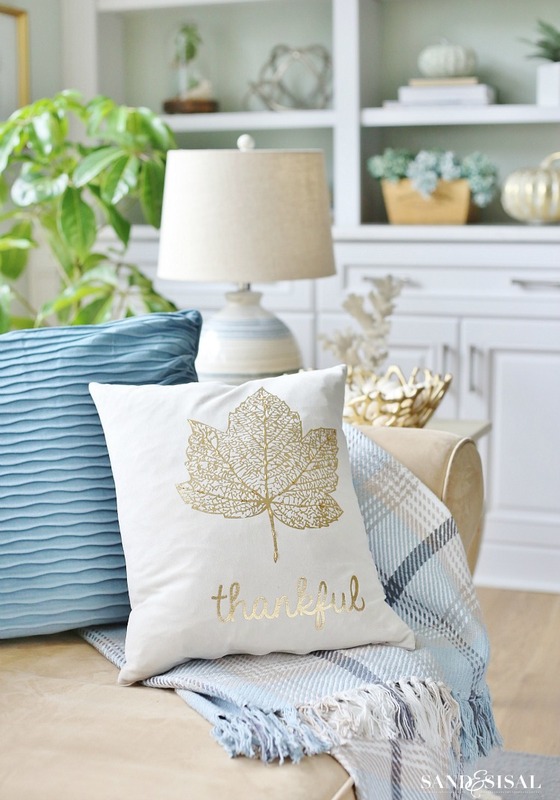 So light and bright….especially love the thankful throw pillow! Love your style! I love the throw pillows! Love the thankful pillow! Gold on creme gets me every time! Beautiful! Love all the soft calming colors? So pretty as I also love the sea and sand. Loved the mantle and table arrangements. Perfect except was wanting to see picture of that pie! Mirrored pumpkin pretty neat too. Beautiful home. I love the windows, the built ins and the way you decorate with a touch of gold. The staging on your built in bookcases is fabulous. I am so jealous of the fireplace/bookcase wall! It’s my dream. Thank you Barb! It was our dream too and I’m so happy it finally became a reality. I love your Thankful pillow! And the pumpkin with hydrangeas centerpiece. So pretty! Really love the color scheme throughout your home. The touches of fall are so pretty. I love your style. We have very similar tastes! So beautiful! I love blue decor but always worry how it will transition through the seasons – you did it perfectly!! The white pumpkins and fall foliage caught my eye. I’m always a fan of pillows and throws, so those stood out to me. I love your home – the Wood Leaf Garland definitely caught my eye … but so did everything else! Ha! Thank you! Everything is so lovely. Love the clean crisp feel. Beautiful job you have done! Stunning! I’m loving the white pumpkins and the fake berry vines in the fall colors! Fresh and still seasonal! Your house is beautifully light and airy! I love the gilded pillows. Your home is beautiful and calming..and coastal beach like mine in Florida. A number of items caught my eye..especially the faux coral from hg. Your embedded glass pumpkin..I must find along with the cutout trio white pumpkin. Thanks so much for your lovely tour. Oh, I love the thankful leaf pillow too. Love your beautiful Virginia home- it is full of hope and joy! 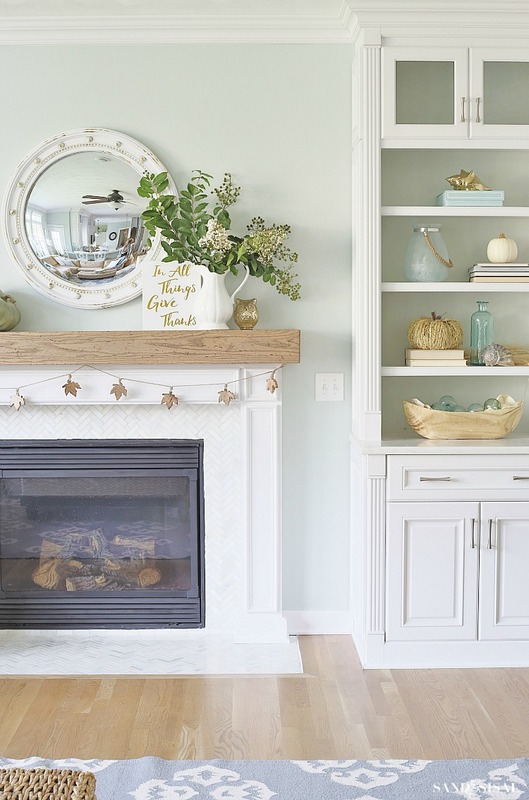 Love your coastal decor and how you’ve added fall touches. Thanks for the giveaway. I loved all of the different neutral and natural pumpkins you used to fit in with your coastal decor – I don’t really think about fall items fitting in with coastal decor, but you incorporated them perfectly! Thanks for sharing – great ideas! Blessings to you….. I like the thankful leaf pillow and the mirrored and gilded pumpkin. Thanks for the giveaway. Thanks Barb! Those were custom made to match the kitchen cabinets but we did all the crown moldings and baseboards in the room along with the fireplace and tile. I love how you incorporate fall into your coastal decor style. So well done! I love everything! Your tour is very lovely. I loved the three tiered pierced pumpkin topiary that lights up! Love this post! The gold leaf thankful pillow caught my eye! Love it! Also love the fall coastal decor! Love the green apples in the white dishes. This is just beautiful! I love the clean look, it shows you don’t have to have orange to have a fall look ? Beautiful! Love the blue accents. I love it all…the pumpkins, the coastal feel, everything! Your home is beautiful! I don’t know if it’s really fall decor but I love the owl! I also love the gold on the white pillows! I am addicted to Homegoods and TJMaxx!! My credit card needs a break. I go multiple times a week to see what is new, including earlier today, since I am currently getting my home painted the sea salt color and need new decor. The coastal section is my favorite. I am definitely going to have to check out the fall section next visit, I am loving all the pumpkin decor that you found! Everything is beautiful. Loving all the white and soft wall color. Beautiful! I love the throw pillows. Love how you incorporate fall with a costal feel! I like the natural elements and white pumpkins. I absolutely love your coastal fall decor and think I pinned every picture! Thank you for sharing your gorgeous home! 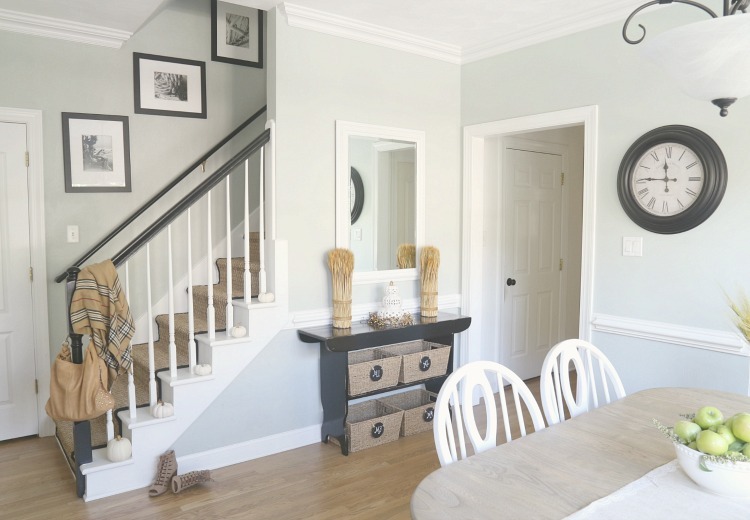 Love your use of coastal hues …. whites, aqua, golds, natural wood …. just beautiful!! Your coffee table and gray rug are so nice. Love that coffee table. The colors in your home are very peaceful and relaxing. After the chaos of the past year, it must feel great to relax in such an inviting space. Thanks for sharing! Home Goods is one of my favorite places to shop. They always have so many great coastal decorating finds. Love it! You have such a beautiful house. We decorate mainly with natural elements, so the pumpkin and hydrangea arrangement on the ottoman really caught my eye. I normally do that same type of arrangement, but instead use oak leaves. The hydrangea adds a softer element, and I feel I will be switching out some oak leaves for these flowers this year. Thanks for the inspiration. That sound beautiful! I’m hoping to do something like that too later this season. My neighbor has a huge maple tree so I’ll be snagging some leaves from that one! Thanks Kerri! The pumpkins on the stairs are a great idea! I might have to borrow that one ? I really want some white pumpkins for my mantel!! I love your accent color in each room!! Gorgeous! I can’t choose any particular items. I am loving the color scheme. The white/wheat combo is awesome. That gold “thankful” pillow needs to live at my house! I love all the white and neutral colors for the pumpkins. Do you use traditional Halloween/fall colors elsewhere in your home? Very pretty! Love your coastal style. Love the pumpkins along the staircase. Adorable! Love the wheat pumpkin and the bowl with the hydrangeas and white pumpkin. Simple and so pretty. Love the sparkle pumpkin and Owl!! It all looks amazing!! OMG I’m obsessed with your coffee table !I need it! And i need some throws for fall! I love the calm and cool colors you use in your home and yet it feels incredibly warm! I love to see the subtle nods to fall. Love it! I like your white pumpkins throughout the house and your gold and white owls. You achieved a nice nontraditional fall look by not using the usual fall colors. Love the fireplace! I decorated mine very similarly! I love it! Your home is beautiful! And I think I need that gilded leaf pillow. Absolutely gorgeous as always Kim!!! Your home is just lovely!! The white pumpkin with greens on the coffee table is perfect! Love the blue touches to your decor. Ha!!! I love you so much!Thank you! I worked hard on the photography but the styling of the HomeGoods is just things I LOVE! I guess when you love your home it shows through! And I LOVE this room! Beautiful! Thank you for sharing your heart of thanksgiving & loveliness! Your home is beautiful — I really love the thankful pillow! Happy Fall! Everything in your home is just perfect!! 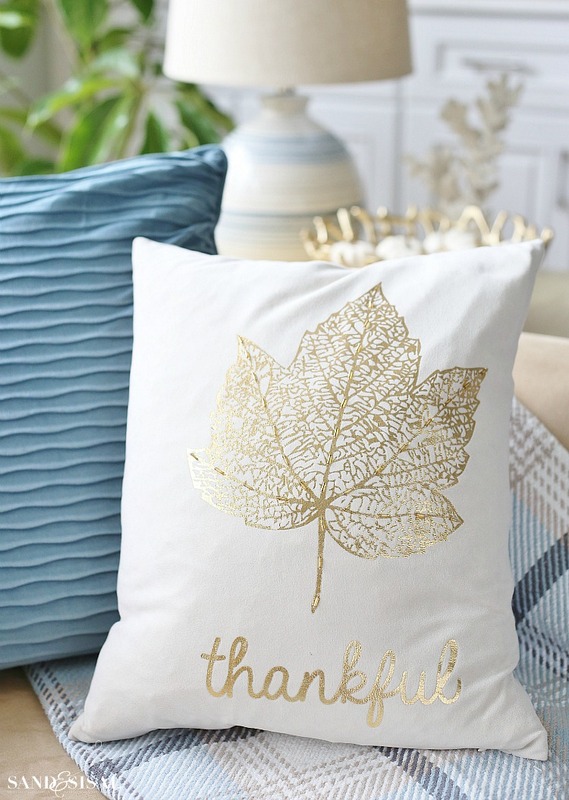 I absolutely love the gilded leaf “thankful” pillow. Love all the touches of blue and green throughout your home! Love so many things here! Can’t wait to see what my Home Goods has. I’m loving white pumpkins right now! The Gold Leaf Pumpkin and the White Cut-Out Pumpkin Lantern are my favorites! Really like your fall touches with your coastal vibe! Love HomeGoods! You have such a good eye, I’m drawn to your boards on Pinterest all the time, a newby to the blogs and tours but am enjoying very much. Your choices of HomeGoods items are everything I would pick, too. Loved the tour, you have a lovely home. Happy Fall ! What a lovely, lovely home.Your talent shows everywhere in the home. And I, like you, find Home Goods “the place where I find things I didn’t know I wanted or needed”! Love going there, also like Stein Mart. I love it all, but I really love the White Cut-Out Pumpkin Lantern. Gorgeous!! As is your beautiful home. Thanks for the chance! Beautifully done! I love the gold leaf pillow! I also love how you incorporated fall without using the typical orange, yellow and Browns! 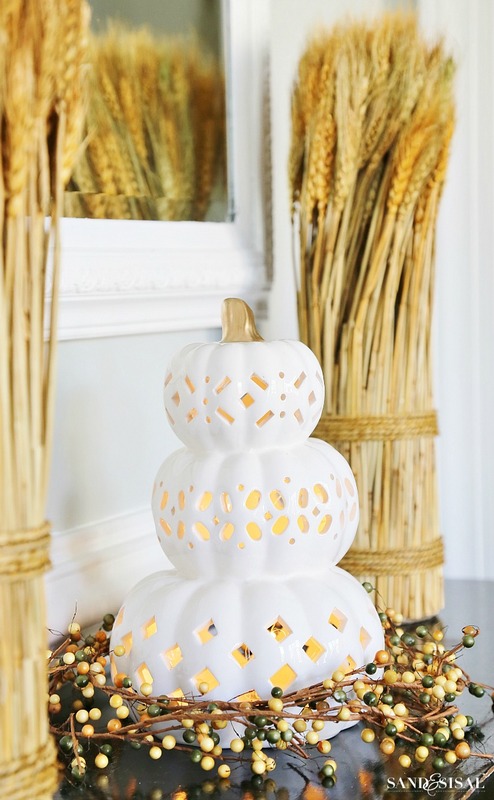 absolutely LOVING the 3-tier pumpkin lantern….. guess i’ll be heading to home goods today…. and i also love all of the throw pillows — i love using them to quickly change decor from one season to the next. i actually made covers for my pillows so i don’t have to store the bulky pillows… just change out the colors for each season. 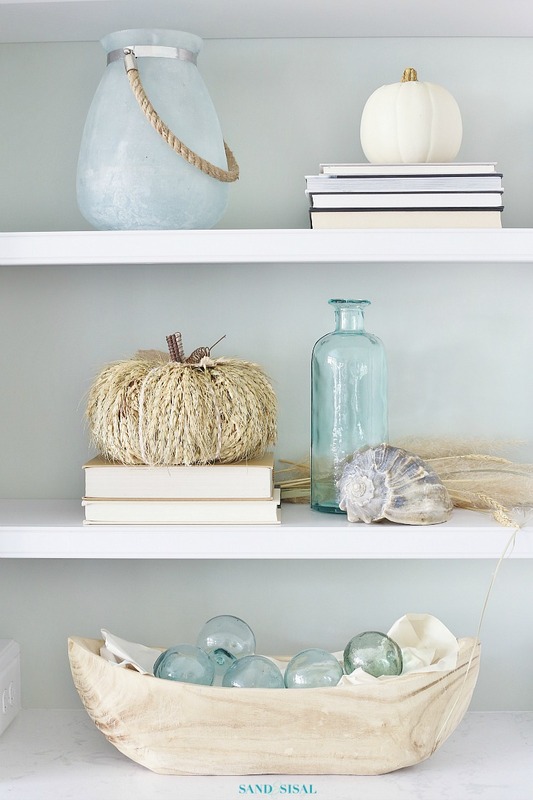 Beautiful all around..love the sea glass pumpkin on bookshelf and white pumpkins!! Sea salt paint colors is one of my faves for coastal living…gorgeous! I love this all! The blues and whites and love the built ins! Your fall tour is absolutely stunning! I love every bit of it! 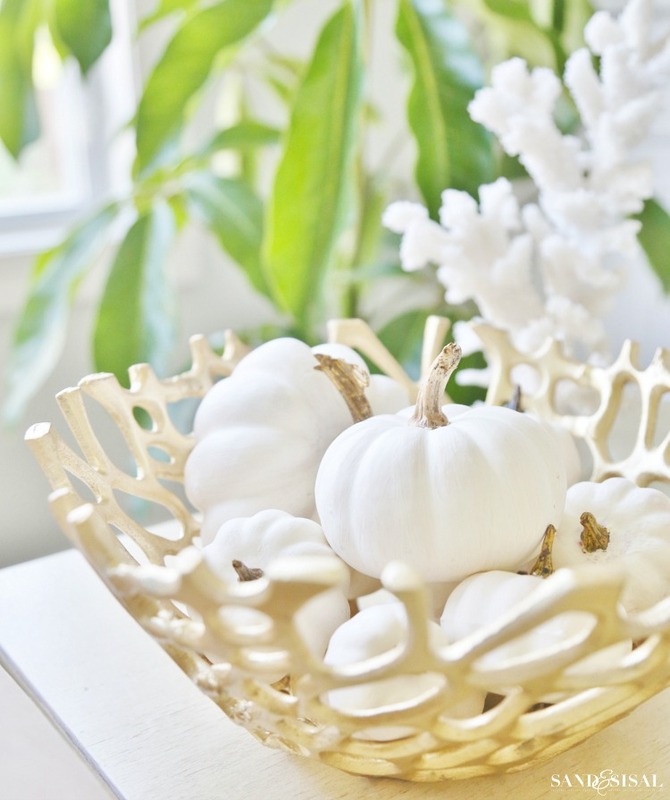 I’m loving your white pumpkins, sea glass decorative balls & white bowls. Such a calm feel to your home. Thanks for inviting us in for a peek! Your home is beautiful! The wheat straw pumpkin caught my eye, but all of it is really pretty. Those pillows are so adorable! I have my eye on a set of linen armchairs at HomeGoods, inspired by your furnishings. Would love to get a gift card for them. Love everything! Can’t wait for how you made the hydrangea centerpiece. I love every single item!!! ❤️ I’m pretty sure you are my spirit animal! I seriously am drooling over it all! I love the leaf garland on your mantel! I love the faux bois pear and the thankful pillow! I love everything, but specifically the rope pumpkin on your built-in bookcases. So crafty! I’m obsessed with the gold leaf pillow, the DIY faux bois pumpkin (I’ll need to make one for myself!) and the natural wheat bundles. And I love how the decor incorporates fall while still staying true to your home style! Gorgeous. I love the way you styled the shelves by your fireplace. And the mantle too! So cute! I love the light, airy look! So soothing! I love all the different ways you used pumpkins in the rooms. Unique! Beautiful! I love how it’s fall but still so light and airy! I do love the pumpkins 🙂 Especially loved the way you combined coastal decor with fall…might be ‘borrowing’ some of your ideas! I love your calm and coastal look. I almost bought that white sweater pillow myself at Home Goods but it was damaged. I am in love with your color palette!! Could you please share the paint colors you used on your walls?? Thank you Deborah! The family room is SW Sea Salt and the kitchen area is SW Comfort Gray. I love your coffee table! Do you remember where you got it? Your house is beautiful! Where did you find the pelican wall art? I am, at the present time, decorating my bedroom and bathroom in colors of aqua, coral and navy blue. Your colors are lighter and soothing. Do you think you could ever live with the brighter colors? Just wondering. The other nice thing that I’m enoying with the lighter paint colors in the rest of the house, is that you can easily add pops of brighter colors with accessories and change them out with the seasons. Thanks so much for stopping by Jean! Please tell me about this coffee table. Resource? This is exactly what we are looking for. Thank you. I shopped at Home Goods up until 2004 when we moved away from Maryland. I have missed them tremendously and am happy to say that they are FINALLY coming to our area and will be sharing a store with TJMAXX. It’s called a combo store. So happy that they will be here come late October. Time for a shopping spree?!?!!!! My coastal bedroom is done in aqua, navy blue and coral. Do you think these colors are too bright or harsh? Your bedroom colors are more neutral than mine. Do you think you would ever like the bright colors?